Nico Rosberg (4th): "Singapore was a disappointing weekend for my team. We were far off the pace the whole weekend and Lewis' car had to retire. So I really hope that these were unique circumstances and our car didn't suit the track and conditions. The problem is that we don't really understand why Red Bull and Ferrari were so much quicker here. The start of the race was a bit chaotic. In the installation laps my engine went off a few times, so I couldn't do the same start procedure, which I practised 100 times. I had to adapt but it worked out okay, so I was able to keep the positions. P4 was the maximum today, so we have a lot of work to do for Suzuka to understand what went wrong." Lewis Hamilton (DNF, Boost Pressure): "The race was going very well. For me it felt like I was driving at my best in the race. I think I had the pace to win. I did everything. I was on the prime keeping up easily with the guys at the front on the option. My pace was really good when I started to lose power. I felt like the team was working as hard as they could and these kinds of things just happen. It's unfortunate for the team as I was feeling real good out there, so optimistic. But it was better to retire and save the engine. We will work really hard on figuring out what it was but I am not worried about losing this engine. Our reliability is really high as we had an amazing season so far. It's still a long way to go and I know I lost some points today, but I was fast and on form and I will make sure I bring that out to Suzuka to fight back!" Paddy Lowe: "We clearly did not put ourselves in the strongest position during qualifying yesterday, starting from the third row, and it proved to be a long and painful race. It was a case of damage limitation for Nico who salvaged P4 today and didn't put a foot wrong. For Lewis, he suffered a technical problem that meant he was not getting full power, and we couldn't solve that while he was out on track. It was difficult to understand the pace during the race because the leading cars were controlling strongly their pace to make a two-stop strategy work. All attempts to find something different with the strategy that could have given us an opportunity were thwarted by the two Safety Car periods, which fell into a perfect two-stop window. We will do our analysis to understand the problems we faced this weekend, and then aim to bounce back strongly in Japan." Toto Wolff, Mercedes Motorsport Director: "I think that is what's termed a character-building weekend. Given our pace and the way the race unfolded, P4 was the maximum we could expect today with Nico. On Lewis' side, we tried everything we could to resolve the loss of power while he was out on track but there was nothing we could do and we retired the car when that became clear. He lost valuable points today. Ever since we put the car on track on Friday morning, we were on the back foot and it only improved a little today. There were times in the race when the pace looked okay but the guys in front were managing their tyres, too, so we must be realistic about our level of performance at this circuit. Now we need to analyse everything precisely, understand the wrong turn that we took this weekend to learn the right lessons - and then close this chapter. One bad weekend doesn't overshadow our achievements so far this year but we know that there is no room for complacency after a weekend like this. We will aim to hit back strongly next weekend in Suzuka." Daniel Ricciardo (2nd): "I think this was our best chance of a win and we got close, so we can be proud of what we did. We have made the most of our opportunities here. At the start Seb just went away and then I was coming back to him and if it hadn't been for the Safety Car, we'd have got pretty close and maybe an undercut would have been possible at the pit stop. Making both stops under the safety car affected our chances and I think that dictated the race really. In the first stint we were coming on quite strong, with Seb pushing hard to break the DRS gap. But as the laps were ticking down, we were starting to come alive and I was able to lean on the tyres a bit more. Then I was frustrated to see the Safety Car come out, but I knew I still had to make one more stop so I had one more chance. But Seb seemed to have learned from the first stint and started easier than in the first one and was able to pull away later. I was able to close on him again, before we had another Safety Car. That was that really because it's hard to overtake here. We got the fastest lap right at the end and we can be proud of that. Moving forward, Suzuka is usually a good track for us, although I don't expect to do as well as there, but we can aim for the top five. It's good to get another podium, I'm really happy for the team. The last few races the chassis has really come alive so thanks to the guys for that." Daniil Kvyat (6th): "I was unlucky with the timing of the Safety Car as I pitted a lap before it came out. It seemed the Safety Cars didn't like me at all today, it must be something personal! But that's life. That worked against us and it wasn't a good race for me, but we couldn't have done anything else. I lost two places to Mercedes after the first stop and a place to Bottas after the second one. After that, I was always in traffic behind cars that were a tiny bit faster down the straights, which was just enough for me to be unable to pass. On the plus side, we kept it on the track and scored some points. The team did a very good job this weekend and the car worked very well. 8 points is the maximum we could have got with all that bad luck. My time will come. Our car has always worked well in the corners, so our team's result here is not so surprising." Christian Horner, Sporting Director: "A great performance by Daniel today in what was our most competitive weekend of the year. He pushed all the way from start to finish, but he was a bit unlucky with the Safety Cars. Our pace was better during the last part of the stints than the Ferrari, and the Safety Cars came at the right time to give Ferrari and Sebastian a bit of a breather. But nonetheless, a fantastic performance to finish second. Dany was unlucky with the timing of both the Virtual Safety Car and the Safety Car itself, which cost him places to both Rosberg and Bottas through no fault of his own. But a good collection of points for the team as we head into Japan. Congratulations to Sebastian, both he and Daniel were in a league of their own today." Matthieu Dubois, Renault: "After a very long two hours, we are all glad to see four Renault cars in the points. It was a great second place for Daniel, who kept everything under control as the race took different turns. Unfortunately for Daniil we pitted twice just seconds before the safety cars and lost out to Mercedes and Bottas in the operation. It is nice to see our hard work is starting to bear fruit from both reliability and performance perspectives and we are very much looking forward to prove it again next Sunday in Japan." Valtteri Bottas (5th): "It was a good race for me. The start was good, the pace was a little bit better than we expected. I could put a bit of pressure on the guys in front and undercut some people. The pit crew did an amazing job today under pressure. We did what we had to, got our heads down and took our opportunities. This was the maximum result today so I'm pleased." Felipe Massa (DNF, Gearbox): "It was a very unlucky race for me. My problems started with the collision I had with Hulkenberg after my first stop. I was braking for the corner and he turned his car in on mine, leaving me with nowhere to go, so we hit. This caused a slow puncture on my front-right tyre and the extra pitstop put me back many positions. I then had a gearbox problem. I was changing gears from 2nd to 3rd and was getting neutral. It seemed to resolve itself but it happened again and I had to retire the car. It was one of those races where things just weren't going my way. We need to concentrate on recovering some of our lost points at the next race." Rob Smedley, Head of Performance Engineering: "It was an excellent race for Valtteri today. He showed great pace and the gap from qualifying disappeared, so we were fighting with Kvyat and Rosberg throughout the race. We made good strategic calls, when Kvyat pitted we stayed out knowing a safety car could come at any time, and we got ahead of him. Felipe getting tangled up with Hulkenberg, who subsequently received a penalty, was unfortunate and put us on the back foot with that car. His retirement was a gearbox problem, the car was jumping out of gear so we need to investigate that. I'm happy with the day but it's tinged with disappointment because we've lost some points with Felipe's car." Sebastian Vettel (1st): "It was an incredible race today, in fact all in all an incredible weekend and it is difficult for me now to sum it up. The race was intense and long, I had some pressure from Daniel behind me, we were the quickest two cars out there today, but I was able to control the pace and look after the tyres, which ran ok for the whole weeekend. The car felt fantastic, I could control the gap until the end. Today we are in paradise, but we know we're still a long way to go. It has been a surprise that Mercedes hasn't been on the pace this weekend, we don't know why, but to be honest we don't really care. I am very happy for the team today, there has been a lot of work going in since the day I joined in. For the next races we will keep pushing 100 percent, we'll give our maximum, like always. As long as there is a chance we have to go for it, we have to do everything we can. Mercedes are the ones to beat, the best way to do it is looking after ourselves and doing the best we can." Kimi Raikkonen (3rd): "I have mixed feelings: I'm happy to be third, considering how difficult it was yesterday, struggling with the grip and the handling of the car, but I'm a bit disappointed for not having been able to fight for a better position. Today I knew it was not going to be easy: it was a tricky race, on new tires I was able to follow Daniel easily, but then I was starting to have the same problems as yesterday, and I did not have enough speed for trying to catch him. First and third is a great result for the whole team, but of course it could have been better. It's hard to predict how is going to be in the next races , but I don't think we should get carried away. Obviously some tracks fit you better that others: we'll do our best as usual. Hopefully we'll find out that we can be competitive again fighting at the front. We have done an amazing job as a team so far, we keep improving, building and learning a lot in all areas, we are going in the right direction." Maurizio Arrivabene, Team Principal: "This is a fantastic win! It's fantastic for Seb, who yesterday put in an awesome qualifying lap, something which reminded me of the great champions of the past. But this result is also fantastic for the whole team, for all the guys here in the Singapore garage, and also for those who work back at Maranello. Kimi's third place today clearly shows how important and effective was the development work we carried out on our car. Today we have both drivers on the podium and we're happy with that. And yet, I was not sure that we could make it until we crossed the finish line. A race win is something you build step by step, from the start onwards: and on a track like this, full of unpredictables, and with two safety car periods, the real problem was keeping concentration. Now I don't want to make predictions for the championship: there are still may points at stake, and obviously we'll do all that's in our power to stay in front. But always with great humility and a huge respect for other contenders." Jenson Button (DNF, Gearbox): "We should have scored points today, and we would have scored points if I hadn't had contact with Pastor [Maldonado] and we hadn't had gearbox problems. There's lots of 'ifs' and 'buts', but the car felt alright to drive, which is a positive. We went very long on our stops, and I was able to look after the tyres well, which is always helpful, and the second Safety Car helped us. But it's been a tough season. Everyone is feeling it, but it's not slowing us down in terms of how much effort everyone is putting in, both in Woking and Sakura. So the team will now get their heads down and focus on the next race, in Japan. It's Honda's home circuit, but it'll be another tough weekend. We'll do our best." Fernando Alonso (DNF, Gearbox): "Today's race was definitely disappointing for us because both Jenson and I could have been in the points today and we missed that opportunity. Gearbox problems caused the failure of both cars. Before retiring, though, we were running in the top 10, and our performance on the Supersoft [tyre] was quite good, so I think we could have kept that position until the end. But to score points you have to finish, and we didn't today, so today was a reminder that we need to work harder than ever. We still lack performance and reliability, and fixing those two things represent a lot of work and we need to do that." Eric Boullier, Racing Director: "Our cars showed encouraging race pace today, Fernando's best lap only 1.1s slower than Daniel's [Ricciardo] fastest lap of the race, despite Fernando's lap-time having been set with quite a lot of fuel still on board. However, today is of course a disappointing day for all at McLaren-Honda, since we were forced to retire both our cars before the finish with gearbox issues. We'll investigate the cause or causes of those issues, in an effort to make sure they never recur. From here we'll travel to Suzuka, one of the greatest racetracks on the Formula 1 calendar, the home Grand Prix of our engine partner Honda, whose power units performed with admirable reliability throughout the past three days here in Singapore." Yasuhisa Arai, Honda: "At the beginning of the race, our pace was good, and we had hopes for a double points score. However, both cars had to retire due to gearbox issues. It was a disappointing result, because our set-up became better as the weekend progressed. As today's race was a back-to-back race with Suzuka, we don't have much time, but we'll gather whatever data possible from today, fix the problems, and prepare for our home Grand Prix." Sergio Perez (7th): "It's a good feeling to end such a demanding race with seventh place and six points. The start was very important because I knew I had to get ahead of Fernando [Alonso] and I also jumped ahead of Romain [Grosjean]. After that I managed to keep up a good rhythm and I had new tyres immediately after the first safety car so I concentrated on looking after them and building a gap to the cars behind. The second safety car didn't help us because it gave the Toro Rossos a big advantage with their fresh tyres. We knew they were catching us quickly and it was tough to stay ahead because my tyres were getting old and it wasn't easy to keep the car away from the walls. So the last 15 laps of the race were very demanding but fortunately we could hold on for seventh." Nico Hulkenberg (DNF, Accident): "That's a really frustrating way to end my race. I was feeling confident with the car; I had made my first stop and I was in good shape. The accident with Felipe [Massa] was very unlucky and I don't understand why I've been given a penalty before there has even been the chance to discuss the incident in the stewards' room. I saw Felipe coming out of the pit exit as I went through turn one, but I was ahead in turn three, I was on the racing line and I took the corner as usual. Then I felt the contact with my left rear and my race was over. In my view it was my corner and I'm surprised Felipe backed out of it much too late, locking up just before he hit me." Dr. Vijay Mallya, Team Principal: "Another bittersweet race in which we weren't able to get the reward the pace of both drivers should have warranted. Checo was brilliant: he was smooth in attacking and didn't put a wheel wrong when defending. The ending of the race was a bit nerve-wracking, with Checo coming under intense pressure from Verstappen, but he was able to play on the strengths of his car and didn't allow for any overtaking opportunity to arise. Nico had excellent pace but he didn't get the chance to show it. He was ahead of Felipe coming into the corner, took the line he was expected to take and yet Felipe didn't back out until it was too late. We are surprised a penalty was given to Nico, especially considering that he was the one who ended up out of the race and with severe damage to the car. We're even more surprised the drivers weren't called to the stewards' room to give their view on the events. In any case, tonight's result strengthens our fifth position in the championship. We managed to increase our advantage over the teams behind us and we will aim to continue in this fashion next weekend in Japan." Max Verstappen (8th): "It was an amazing race, I enjoyed it a lot! After stalling at the start I thought it was over, as I was pushed to the pit-lane and then re-joined the race one lap behind... But I just kept on pushing and to finish P8 is just fantastic! My pace was great and once again I really enjoyed all the overtaking! I don't think there was any reason for me to give up my position after going from being one lap behind to being back in the points, I think I deserved that P8." Carlos Sainz (9th): "It was certainly an eventful race! I had a good start, some very good pace at the beginning and the strategy was looking great. Suddenly, during the restart of the race after the first Safety Car, my gearbox went into neutral and I found myself at the back of the field. Then I started to overtake and have a lot of fun, climbing back up to P9, behind Max, who was pushing Perez. After seeing him try to overtake him for 10 laps, I just thought maybe I could try during one lap, and if I hadn't been able to I would've given the position back to Max. I just wanted my chance, but he decided not to give it to me. It's something we need to talk about as a team, but overall I have to say that I'm very happy to have finished in the points again! Let's keep on pushing, the next race in Japan is only seven days away!" Franz Tost, Team Principal: "The beginning of the race was quite a big shock, as Max stalled the engine and could not start the race from his well-deserved P8 on the grid. We have to find out what happened, because the anti-stall should have prevented this from happening. We were lucky with the Safety Car, and Max was able to catch-up after being a lap down. He drove a fantastically, with his lap times within the top five throughout the whole race. Towards the end he was fighting with Perez for P7, but unfortunately he wasn't able to overtake him. Nevertheless, his eight position, under the circumstances of his race, is a success. Carlos struggled a bit at the beginning because after yesterday's crash in qualifying, he was forced to start from P14. After the Safety Car, he had a short technical issue, going into neutral, which we also need to investigate to understand why it happened. He lost a lot of positions because of this. At the end of the race, we thought that Carlos would catch Max faster, because he had new Option tyres on, while Max had fitted used Options. Therefore, we calculated that Carlos could've had a better chance to attack Perez, but he didn't close the gap to Max well enough to really demonstrate that he could do this, so there was no reason to end up swapping their positions. I must say that the performance from the car and the drivers was really fantastic and the new upgrades worked well. I'd like to congratulate the Aero department for their great job back at the factory, because here at the track we've confirmed that all their calculations were actually valid. The Vehicle Performance group has also worked very well, because we really have a competitive car, which makes me confident we can also do a good job next week in Suzuka - I look forward to it!" Cedrik Staudohar, Renault: "Overall it was a very good race and weekend, although we could have achieved a better result without the stall on the grid from Max. The engines worked perfectly all weekend and the crew did a great job trackside to ensure we had no issues. Let's continue in this form to ensure more good results for the team in the forthcoming races." Pastor Maldonado (12th): "It was a really difficult race. The contact from the McLaren was small but enough to break my diffuser. I was defending on the inside and I don't know where Jenson wanted to overtake me. It's a very narrow corner where it happened and there was no chance for him to overtake. The damage meant we lost performance at the rear at the time in the race when we wanted to preserve tyre life. Sadly it wasn't possible to maintain the pace and the tyres so we had to make an additional, unplanned stop." Romain Grosjean (13th): "We had an aggressive strategy planned for today, which looked good since we were as high as P8 at one point but the first virtual safety car cost us dearly. I lost a lot of places on the first lap, there was quite a lot of sliding going on and, as we knew this wouldn't be a great track for us - like Hungary and Monaco - we knew it would be difficult. There was nothing left in the tyres towards the end of the race and as soon as we were out of the points, we chose to retire the car as we had some concerns with the gearbox and didn't want to risk a penalty in Japan." Nick Chester, Technical Director: "That was a long tough race for us. Romain lost positions at the start so we brought forward his stops to undercut and gain track position. Unfortunately this meant we missed out on a quick pit stop under the virtual safety car at the first stop. We suffered worse tyre degradation than expected on Romain's final stint which cost us in the last few laps. Pastor made up positions from his start but was compromised later on after the damage sustained from Jenson. We are now looking forward to Suzuka." Federico Gastaldi, Deputy Team Principal: "We scored no points today but we certainly fought hard. It's a long, hot and humid race so thanks to Pastor and Romain for pushing to the maximum for every lap. Everyone in the team has been working hard all week so it's frustrating for all of us when we fall short of the points. We're certainly focused on a better result in Japan." Alexander Rossi (14th): "My Formula 1 debut has been a long time coming, but today has been pretty special. All the hard work to get here finally paid off and it was a fantastic feeling to be racing on the streets of Singapore in my first ever Grand Prix. It wasn't the most straightforward of races; I didn't get the best of starts, and as the procedure is quite new to me, it's something I'll need to work on. I recovered quite well though and managed to get a good run into Turn 5, where I was able to get past my team-mate. Everything was going well until around the midpoint of the race, when I lost radio communications. This was particularly challenging because of the second Safety Car period and I wasn't able to receive instructions from the team about when to unlap myself. Despite that, I think we managed everything well and I'm very appreciative of all the effort put in by the team to make my Grand Prix debut a successful one." Will Stevens (15th): "Overall, it hasn't been a good weekend for me. Today I actually had my best race start of the season, but unfortunately I made a mistake on the first lap, which cost me position. The safety car helped out, and I tried my best whenever I was close enough, but there was too much tyre degradation on the rears towards the end. It's a big shame, because I've really enjoyed racing on the streets here, but sometimes things just don't go your way. Hopefully the next time out at Suzuka will be a more typical race for me." John Booth, Team Principal: "I'd like to start by congratulating the whole team on an incredible job here in Singapore this week, culminating in our second best combined race result and our ninth two-car finish of the season. This is not an easy environment for any team member to operate in, and that's before we add a new driver into the mix. Our trackside operation this week has been incredibly slick and particularly creditworthy were the substantial repairs required on both cars in the field on Friday; cars which, today, enabled both drivers to take the chequered flag. As we saw, this was not the case with some teams further up the field. The drivers did an excellent job in what was a tough race, Alexander coping admirably with the pressure of his F1 debut. He delivered a solid and confident performance, whilst also having to contend with having no radio communications in the second half of the race, which was tricky because of the instructions we needed to give him during the second Safety Car period. Will also did a good job, but was battling rear tyre degradation for the final stint and did well to finish the race on that set. All in all, a very positive outcome at the first of the fly-away races." 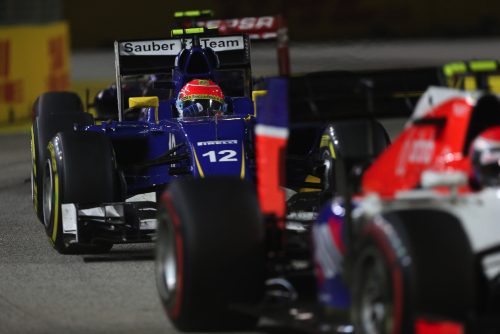 Felipe Nasr (10th): "It was a very challenging race for us today. We had planned a two-stopp-strategy, and we knew it would be difficult to make it into the points. It was going well as I was up in the top ten after the first safety car phase. Unfortunately, when the second safety car came in I lost front tyre temperatures. When the re-start happened my pace was not good enough. I lost a lot of ground and had to wait to let the tyres recover. However, in the end I am very happy for the team and also for myself to have scored one point. We did not have an easy weekend. It is good to have finished the race with some satisfaction." Marcus Ericsson (11th): "I was satisfied with my start, as well as my first lap. I managed to get Jenson (Button) with a good move. After that, I was pushing Felipe (Nasr) quite hard, but it is difficult to overtake on this track. However, after the first pit stop we unfortunately missed switching off the pit stop buttons on the steering wheel. I was then out on track with the brake balance for the pit stop procedure, which caused a massive lock up at the rear. That was unlucky. After that, I had quite a satisfying pace. Overall it is nice that Felipe scored one point, but for me it is a bit disappointing." Monisha Kaltenborn, Team Principal: "Considering the results, it was a positive end to a race weekend during which we have made mistakes. Besides of that, we also had bad luck during the second safety car phase. The drivers did their best until the very end. The whole team showed a good performance in the heat of the Singapore night, and this point is well-deserved."